Amalia Fahlstedt was an author and school governor. She is mostly remembered for her activism in the women’s movement in the late nineteenth century. Amalia Fahlstedt grew up in a middle-class family, the fifth child of six. She started writing because of economic worries. Her father was a grocer and ran a shop in Stockholm. When he died the family’s financial circumstances became dire. Upon completing the Misses Rossanders’ teaching course for women, a teacher training programme which also included language teaching, Amalia Fahlstedt began to give classes. In 1877 she opened her own school with her sister Bertha, and thereby obtained a small and unstable income. Through her brother, Eugène Fahlstedt, Amalia Fahlstedt was introduced to August Strindberg who encouraged her to write and helped her to get her first short story collection I flygten published in 1883. Her second short story collection, Ax och Halm, 1887, is a typical example of the polemical literature of the 1880s as it discusses issues such as marriage and women’s options for education and employment. The short story “Ett lefnadsmål” tells the tale of an unmarried young woman who opens her own school. The story presents Amalia Fahlstedt’s thoughts on clarity in teaching, which are inspired by the contemporary reform pedagogy ideas. After Amalia Fahlstedt’s death Ellen Key wrote her obituary which highlighted her free-thinking pedagogical ideas and also described their common hatred of the current school system. The close friendship between Amalia Fahlstedt and Ellen Key is evident in their correspondence, which spanned more than 30 years. Their mutual interests were also revealed when, in 1892, they co-founded the association Tolfterna, which aimed at connecting working women with educated middle-class women for shared discussions of the cultural and social issues of the day. Amalia Fahlstedt never married, and after her mother’s death she and her two siblings, Bertha and Eugène, moved in with their sister Augusta, who was a widow with six children. One of these children later became famous as the author and illustrator of children’s books Elsa Beskow. In her books her mother, aunts and uncle appear in the characters tant Grön, tant Brun, tant Gredelin and farbror Blå. During the 1890s Amalia Fahlstedt published two novels under the pseudonym Rafael: En passionshistoria, 1897, and I dödvattnet, 1889. She wrote another two short story collections, a book for teenagers and two children’s books, which were illustrated by her niece Elsa Beskow. She was also published in several papers and journals and worked as a translator from Italian and Dutch into Swedish. Amalia Fahlstedt died in Djursholm in 1923. 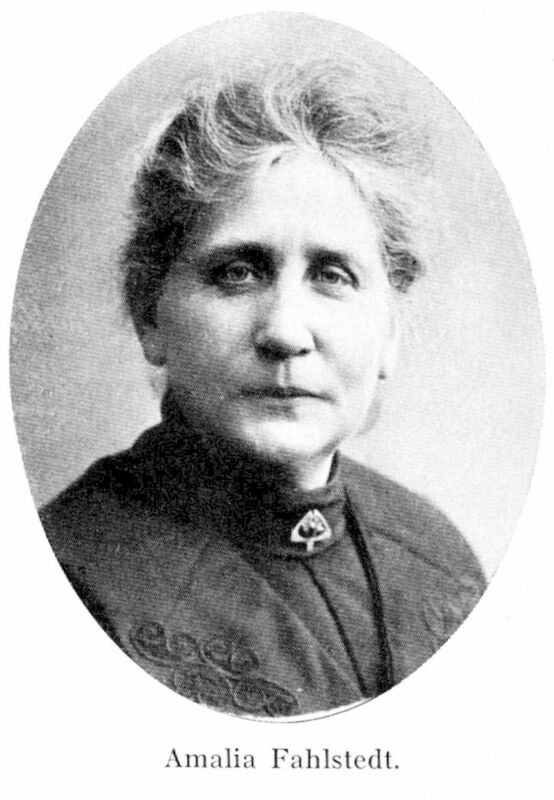 Amalia Wilhelmina Fahlstedt, www.skbl.se/sv/artikel/AmaliaFahlstedt, Svenskt kvinnobiografiskt lexikon (article by Eva Heggestad), retrieved 2019-04-20.